If you are looking for the perfect lamp for your home, you will discover it at Hortons Home Lighting at each of our Chicagoland locations. At Hortons, you will find an enormous selection of traditional lamps, contemporary lamps, Victorian lamps, and Tiffany lamps that will match any style and budget. Lamps can add a unique dimension to any room, and usually come in matching table lamps and floor lamps. Table lamps can be functional and sculptural, and are perfect for living rooms , family rooms, dens, or bedrooms. They provide a fantastic accent or finishing touch to your decorating plan. 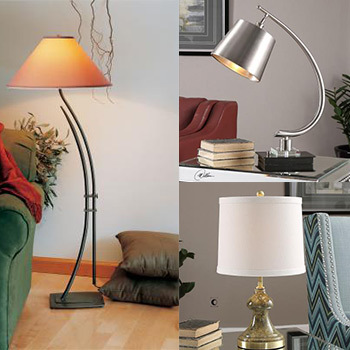 Floor lamps are very useful for general or task lighting, and they come in many forms. Torchiere lamps, club lamps, six-way lamps, and tray-table lamps are a great source of ambient light. For more directional task lighting, as in for desk or office lighting, there are swing arm lamps and pharmacy lamps. Adding the perfect lamp will quickly and dramatically change the look and feel of a room. Start your search for the perfect lamp now with our many brands and styles of lamps to choose from, many that are exclusively sold at Hortons Home Lighting. Lamp Tip: A well-placed lamp can dramatically reduce eye strain by providing sufficient light without the need to over-illuminate the entire room.